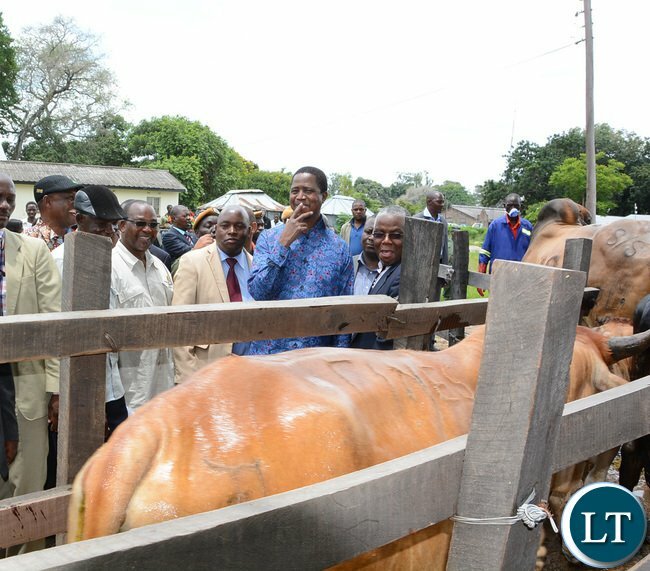 PRESIDENT Edgar Lungu has assured the people of Namwala District that Government will do everything possible to ensure that the area becomes Zambia’s livestock and fisheries hub. President Edgar Lungu has since directed the ministry of Livestock and Fisheries to be proactive to ensure that his desire bears fruit. President Lungu said this when he met four traditional leaders at Corner Point Lodge and later reiterated similar sentiments when he addressed a public rally at Namwala Market ground yesterday. “I want to make sure that using the water bodies around here, we are able to have enough fish to feed Zambia. I would like the ministry to encourage small-scale farming of fish in the backyard,” he said. President Lungu said the Government would ensure that livestock in the area was vaccinated to prevent diseases, livestock restocking and encourage small-scale fish farming. He was hopeful that once the Ministry of Livestock and Fisheries implemented those measures, they would enable the area have adequate livestock and fish for local consumption and surplus for export. “I want Namwala and Kafue plains to become a livestock centre in Zambia so that we can have enough animals to be consumed locally and to be exported abroad,” he said. Speaking on behalf of the traditional leaders, Chief Mukobela praised President Lungu for setting the record of meeting people in the area at district level when previous leaders opted to meet people at provincial stage. Chief Mukobela was also happy that the Government was vaccinating livestock to prevent diseases such as foot and mouth. Other traditional leaders present were Senior Chief Bright Nalubamba, Senior Chief Mungaila and Chief Machila. What a conflicted manguam,,,, so today you have discovered the value of herding cattle? What nonsense! This is what we call visionary leadership. Imagine if you voted on empty promises what would happen to all these projects. People of southern the hour has come for you to jump on the developmental ship. Vote Ecl and all Pf mps. However much you promise or give them Come August 11 it will be Namwala Central HH 32000 Edgar chagwa lungu 75. Mansa Central HH 12 Edgar Chagwa lungu 45000. Why should southern province be always strangers in their own countries simply becoz they cant vote with the rest part of the country? This time all signs are pointing to PF and Lungu are you still going to waste your vote on HH? Look at FDD, MMD and PF pact. what magic are you going to apply to make HH win? 1. All tribes will have a priviledge to own cattle as the program will be rolled out starting with Luapula since all fish has been fished out. My comments have be blocked…why??? These are the benefits/perks of incumbency. The president can campaign anywhere because he is inspecting government projects. But take heart. The Bembas say “ukutangila tekufika”. You may start your journey early but arrive last. ECL started late but did manage to scrape through by the narrowest of margins. Ilas look down upon fishing and a change of mind set is required to make Namwala the hub of the fishing industry. But not to worry. People from Western and Luapula have taken over the fishing industry. Fishing is lucrative. Luka Mumba was able to compete with Thatcher in providing bus services with money from fish until the fish got depleted in Luapula. Katumbi’s wealth can be traced to fish. KK’s socialist policies also killed Zambian businesses. It is the benefits/perks of incumbency. The president can campaign anywhere because he is inspecting government projects. But take heart. The Bembas say “ukutangila tekufika”. You may start your journey early but arrive last. ECL started late but did manage to scrape through by the narrowest of margins. Ilas look down upon fishing and a change of mind set is required to make Namwala the hub of the fishing industry. But not to worry. People from Western and Luapula have taken over the fishing industry. Fishing is lucrative. Luka Mumba was able to compete with Thatcher in providing bus services with money from fish until the fish got depleted in Luapula. Katumbi’s wealth can be traced to fish. KK’s socialist policies also killed Zambian businesses. Am happy the Tongas are proud of their cattle and its high time we emulated them to drive away poverty. Cassava will not help. Upnd thugs blocking the road with stones for someone using a chopper. Lol . Come out from the shell of regionalism. You are the only ones remaining to be civilised. THE WAY TO GO…………….Am happy the Tongas are proud of their cattle and its high time we emulated them to drive away poverty. Cassava will not help. WOW..THE WAY TO GO…………….Am happy the Tongas are proud of their cattle and its high time we emulated them to drive away poverty. Cassava will not help. Is this Lungu making promises again? We all know what PF promises are worth — ZERO! He has conveniently forgotten the famous 90 DAYS! This man can talk. Where are the actions? Collapsed Kwacha, 10 BILLION US$ Kaloba and lots of trips abroad? Does he really think this is doing the job of PRESIDENT? Failed lawyer and now clear for all to see – FAILED President! This rat eater, are these not the same people he mockingly called kachema? The best day for Zambia will come in August when he is kicked out and sent back to his rendesvous in Chawama. What has changed today are not the so called kachemas you were teasing last time? Finish your tours so that come August you will have nothing to cheat people and what has changed of late to visit kachemas? It’s like going to the middle east, and start telling them it will be the hub of oil industry. They have already made it a hub, even with little government support. Yaba, bu UPND nabwena!! They have behave as if they have the Zika virus, but then do they even know what that could be? Are you deaf or illiterate? Read what the esteemed Royal Highnesses said then maybe, just maybe, you may understand what HE Edgar Lungu was talking about. that is if you are capable of understanding anything however simple it is. So do you think that the Chiefs will be happy with your party when your message contradicts theirs? If you cannot think, perhaps let your leaders do it for you, maybe they can understand issues better. As for the London Eye f00l, so is he confirming that tongas are tribalists then? No wonder despite numerous challenges, the UPND has refused to deny the quota system that UPND shall be led by a tonga only, as they said in 2006. Ba Mutati, Nalumango, GBM and other misguided foreigners in UPND, especially the mbeba eater Dr Cannissius Banda this is for you, I hope you have read the message by The London Eye. Time to do a prodigal son is now before it is too late! TODAY LUNGU HAS JUST DISCOVERED THAT HIS STEAK IN THE FRIDGE ACTUALLY COMES FROM FARMING CATTLE..! PROUD ZAMBIAN WITH A POWERFUL HERITAGE WE ARE…!